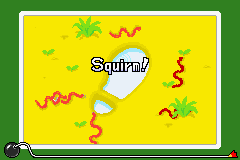 Worm Squirm is a microgame found in the Nature folder in WarioWare, Inc.: Mega Microgame$!. It reappears in WarioWare Gold, this time hosted by Mona. 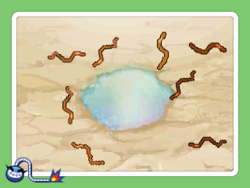 The objective of the game is to find out which worm is the one under the player's control and guide it towards the puddle. 1st level difficulty: There are a few worms near the puddle. 2nd level difficulty: There are more worms near the puddle. 3rd level difficulty: There are many worms near the puddle. This page was last edited on April 4, 2019, at 00:20.